On July 9, FCHEA released a new report entitled Harnessing American Power: Fuel Cell Impact Enabled by R&D . The report provides an overview of municipal fuel cell applications, such as wastewater treatment plants and microgrids, along with recent public-sector fuel cell installations in the United States as of December 31, 2017. On July 11, Servco Pacific Inc. held a blessing ceremony to mark the completion of Hawaii's first publicly accessible hydrogen station. The station is located at Servco Pacific's corporate offices in the Mapunapuna area of Honolulu. The station's hydrogen fuel is produced on-site by electrolyzing water using a combination of grid and solar power. According to Servco, the facility is able to produce up to 20 kg of hydrogen per day and has a storage capacity of 100 kg, enough for about 12 fuel cell vehicle (FCV) fill-ups. Later this month, Servco will begin leasing FCHEA member Toyota's Mirai FCV to customers in Hawaii. Fueling and servicing will be included in the Mirai's lease price, just as the automaker includes for the FCV in California. 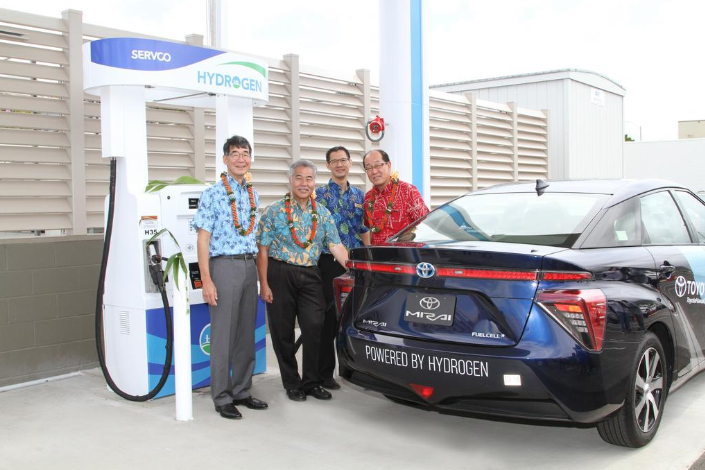 Toyota representatives and a Mirai were on hand for the hydrogen station's opening ceremony, which was also attended by Hawaii Governor David Ige. From left to right: Mark Fukunaga, chairman and CEO of Servco Pacific Inc; Hawaii Gov. David Ige; Thor Toma, senior vice president of projects and new initiatives at Servco Pacific. ; and Yoshikazu Tanaka, chief engineer of the Toyota Mirai. Source: Servco Pacific, Inc. The Servco hydrogen station began construction in August of last year. According to Servco, the station was funded entirely by the company without grants or government assistance. The facility's opening makes Hawaii the third U.S. state with hydrogen refueling stations open to the public, after California and Connecticut. Click here for the full article from Pacific Business News. On July 18, FCHEA member FuelCell Energy announced an increase in annual production at their Torrington, Connecticut manufacturing facility to 55 MW from the current 25 MW run-rate. To help support this 120% production increase, FuelCell Energy plans to add more than 100 new manufacturing jobs at the Torrington facility. According to FuelCell Energy CEO Chip Bottone, the expansion will help the company fulfill 85 MW of new projects slated for production over the next 18 months. This includes a recent award from the Connecticut Department of Energy and Environmental Protection for two projects totaling 22.2 MW. Click here for the full press release from FuelCell Energy. On July 2, Connecticut Governor Dannel P. Malloy announced the approval of construction on a $1 billion data center in New Britain, Hartford County. The data center will be located on the site of a now empty Stanley Black & Decker factory, and will be powered with a microgrid from FCHEA member Doosan Fuel Cell America. The Connecticut Mirror reports that the fuel cell microgrid will initially generate nearly 20 MW of power while taking up just 45,000 square feet of the former industrial factory. Ultimately, the microgrid will be expanded to provide 44 MW of power for the center. Development of the data center will cost an estimated $1 billion, and at this time, the project does not rely on any direct economic development loans or grants from the state government. However, according to Governor Malloy, the state will purchase surplus electricity from the site for use on the electric grid. In a press conference at the Stanley Black & Decker site, Governor Malloy said that the energy center project is expected to generate about 3,000 direct and indirect jobs, more than $200 million in tax revenue for the state, and another $45 million for the city of New Britain over the next decade. Construction is scheduled to begin in early 2019. Click here for the full article from the Connecticut Mirror. On June 28, FCHEA member Nel ASA announced a contract worth several billion NOK from Nikola Motor Company to deliver 448 electrolyzers and associated fueling equipment. The contract will support Nikola's planned network of hydrogen stations for heavy-duty fuel cell trucks. Under the terms of the contract, the electrolyzers will begin to be deployed in 2020, and will produce a total of 1 gigawatt of electricity for hydrogen fuel at 30 stations. According to Nikola, the first two stations will be installed in California and Arizona. The remaining 28 stations will be installed on routes outside of Anheuser-Busch’s Breweries or their distribution centers, to accommodate the 800 hydrogen powered semi trucks they have ordered from Nikola. According to Nel, the order volume for the contract will have a revenue potential of more than $500 million USD. The electrolyzer stacks will be manufactured in Norway and fueling equipment in Denmark, while other supporting components and sub-systems will be sourced locally in the United States to reduce costs and minimize transportation needs. Click here for the full press release from Nel. On June 25, the California Air Resources Board (CARB) awarded $20 million in grants to zero-emission technology demonstrations for off-road applications in freight, farm, and passenger transportation. Several of the grants cover fuel cell technologies, including $3 million for the United States' first commercial hydrogen-powered passenger ferry. The Water-Go-Round ferry will be owned by San Francisco Bay tourism cruise company Red and White Fleet, and the Golden Gate Zero Emission Marine (GGZEM) startup. The vessel is being developed by a series of companies, including FCHEA members Hexagon Composites and Hydrogenics. Renewable hydrogen fuel for the ferry will be sourced through water electrolysis. According to Red and White Fleet, the Water-Go-Round will launch in the Spring of 2020, and operate for three months in the San Francisco Bay. Sandia National Laboratory will gather and assess performance data on the vessel, allowing CARB to further assess the feasibility of this technology. In addition to the Water-Go-Round, CARB awarded a $6.5 million grant for a fuel cell-powered top loader with wireless inductive charging at the Port of Los Angeles. The top loader is being developed by Hyster Yale Group and FCHEA member Nuvera for the Center for Transportation and the Environment. CARB also awarded $5.3 million to City of Long Beach Harbor Department for several zero-emission freight vehicles, including a fuel cell-powered yard truck. Click here for the full press release from CARB. A press release from Hydrogenics on the Water-Go-Round is available here, and a press release from Nuvera on the zero emissions top loader can be found here. Earlier in July, The Home Depot (THD) released their 2018 Responsibility Report, which includes information on their energy and sustainability practices through the end of 2017. According to THD, stationary fuel cell deployments from FCHEA member Bloom Energy have reduced polluting emissions by up to 50% at stores around the United States. 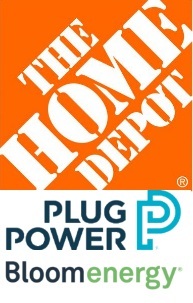 Fuel cell systems installed outside THD stores produce roughly 90% of the electricity each store needs. The 2018 Responsibility Report states that fuel cells were deployed at 178 THD stores by the end of 2017, and more are underway at stores this year. 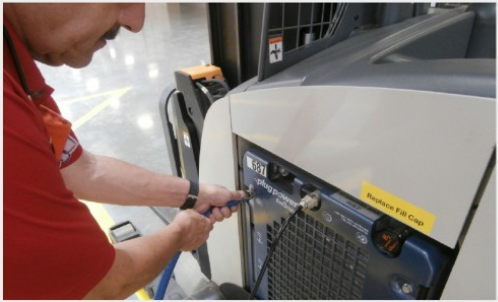 The 2018 Responsibility Report also highlights THD's use of FCHEA member Plug Power's hydrogen fuel cells to power more than 300 forklifts at their Troy Township, Ohio and Savannah, Georgia distribution centers. According to THD, the fuel cell-powered forklifts save the two facilities a combined 3.98 million kilowatt hours of electricity annually. The reduced greenhouse gas emissions are equivalent to removing 635 internal combustion engine cars off the road for a year. Click here for The Home Depot's 2018 Responsibility Report. The section on stationary fuel cell deployment can be found on page 66, and the highlight on fuel cell-powered forklifts can be found on page 69. 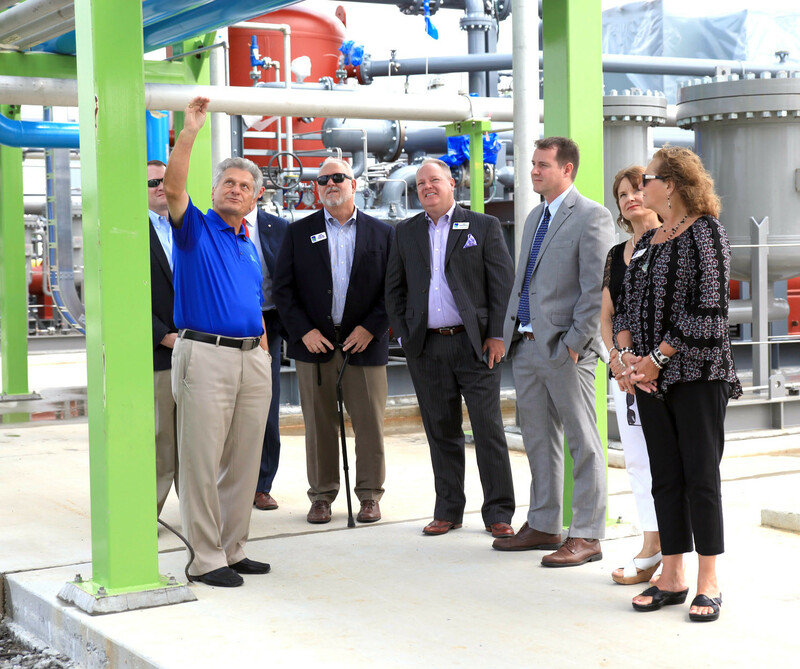 On June 27, FCHEA member United Hydrogen held a ribbon-cutting ceremony for a $40 million expansion to its hydrogen conversion facility in Charleston, Tennessee. According to United Hydrogen CEO Vladimir Prerad, the expansion will allow the facility to produce up to ten tons of hydrogen fuel per day. The opening ceremony brought a number of government and business dignitaries from the local, state, federal, and international levels. Gary Farlow and Doug Berry of the Cleveland/Bradley County Chamber of Commerce attended, State Senator Todd Gardenhire, and State Representative Dan Howell gave remarks, representatives from the offices of United States Senators Lamar Alexander and Bob Corker were in attendance, and Czech Republic ambassador to the United States Hynek Kmonicek also spoke at the ceremony. Click here for the full article from the Cleveland Daily Banner. On June 28, California released their Final Beneficiary Plan for the Volkswagen Environmental Mitigation Trust, which allocates $423 million to the state. The Plan includes funding for fuel cell-powered technology across a variety of applications, along with assistance for the development of hydrogen stations for fuel cell vehicles (FCV). Medium and heavy-duty zero-emission vehicles (ZEV) feature heavily in the Final Beneficiary Plan. The state plans to allocate $130 million to replace fossil fuel-powered transit and school buses with new zero-emission buses, including those powered by fuel cells. According to the plan, up to $400,000 will be available per eligible fuel cell bus. The plan notes that higher funding amounts for fuel cell buses is available compared to battery electric buses to cover the higher initial costs of installing hydrogen fueling infrastructure. For Class 8 Freight and Port Drayage Trucks, the plan allocates $90 million to replace internal combustion engine-powered vehicles. Most of this funding will be be focused on expanding the market as manufacturers commercialize additional zero-emission trucks in the next 3 to 5 years. 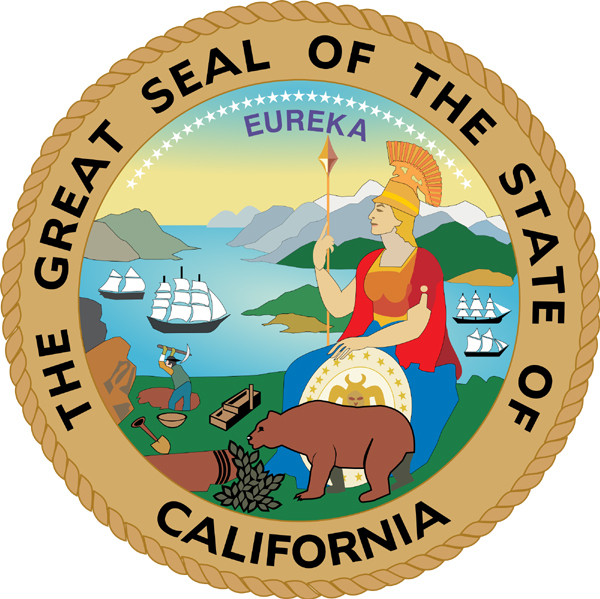 California will fund up to $200,000 per eligible zero-emission truck. The Plan outlines $70 million for zero-emission freight and marine projects, which will cover the full cost of eligible airport ground support equipment and up to $175,000 for heavy-lift forklifts. This category also includes $2.5 million for ferry, tugboat, or towboat all-electric engine repower, including fuel cell technology. 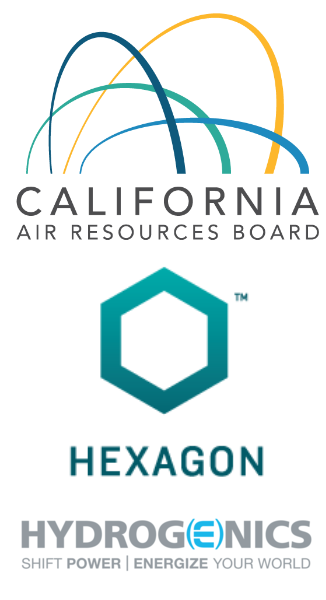 Finally, of the $10 million included for light-duty ZEV infrastructure, the California Air Resources Board (CARB) targets 50% to go towards the construction of hydrogen stations for FCVs. The funding can be used to cover up to 33% of the cost to purchase, install, and maintain a hydrogen station. The Plan explains that hydrogen fueling station funding will be offered to match projects competitively awarded through other funding programs, with emphasis on projects that fill infrastructure gaps. The Plan also acknowledges that additional funding will be needed as part of a broader long-term effort to fully meet growing demand for FCVs and hydrogen fuel. CARB staff is now working with the statewide administrators to begin the implementation phase for the project categories identified in the Plan. Staff expects public working group meetings will be conducted this fall to further develop the project requirements, solicitations, and application processes. Funding is expected to become available in early 2019. Click here for the full Final Beneficiary Plan. On July 16, FCHEA member Hydrogenics announced the opening of North America's first multi-megawatt power-to-gas facility using renewable-sourced hydrogen. The 2.5 MW Markham Energy Storage Facility in Ontario, Canada is owned and operated by a joint venture between Hydrogenics and Enbridge, Canada's largest natural gas distributor. The project was originally selected by the Independent Electricity System Operator (IESO) of Ontario as one of several technology applications for power grid stability and reliability services in the province. According to Hydrogenics and Enbridge, the hydrogen produced at the facility can be used to power fuel cell cars and trains, and it can be blended into the natural gas distribution network to offset traditional natural gas. Click here for the full press release from Hydrogenics. 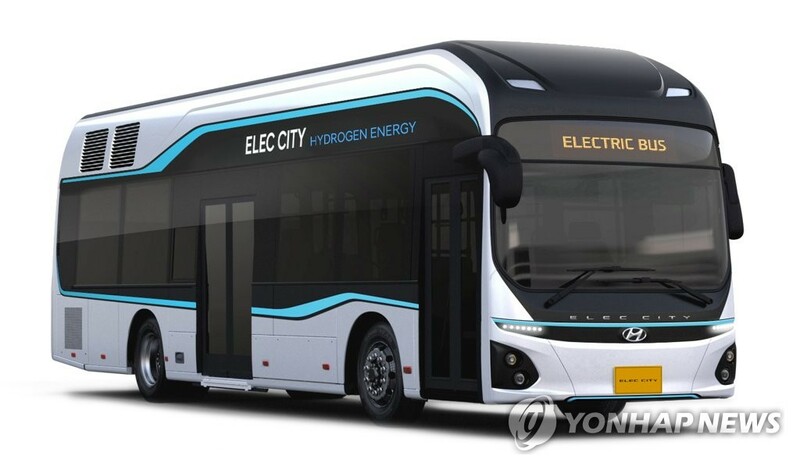 On July 9, the Seoul Metropolitan Government in South Korea announced that starting next month, they will begin operations of the country's first hydrogen fuel-cell powered bus. 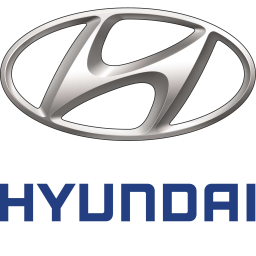 The bus, which was donated by FCHEA member Hyundai, will be test-run on the route connecting Yeomgok-dong in Seocho district to Sungnyemun. Click here for the full article from KBS World Radio. On July 12, the fuel cell vehicle (FCV) taxi fleet in Paris "Hype" received 25 new Toyota Mirai FCVs, bringing the fleet's total to 100. Hype was launched in 2015 by the French start-up Société du Taxi Electrique Parisien (STEP), in partnership with FCHEA member Air Liquide. According to Air Liquide, Hype plans to have a fleet of 600 FCVs by the end of 2020. 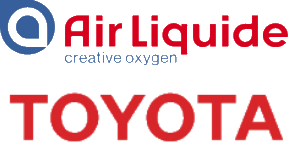 Air Liquide will support the fleet's growth by further developing hydrogen fueling infrastructure in and around Paris. Click here for the full news release from Air Liquide. On July 3, Nel Hydrogen Solutions announced a purchase order from the Uno-X Hydrogen joint venture to build two H2Station fueling stations in Norway. According to Nel, the purchase order has a value of 2 million euros (about $2.34 million), and the new stations are planned for installation in the first and second quarters of 2019. Uno-X plans to install hydrogen stations in every major Norwegian city by 2020. 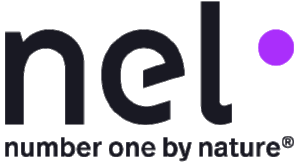 On July 5, Nel announced an additional purchase order from the H2 Mobility joint venture for hydrogen equipment to build two H2Stations in Germany. Like the Uno-X purchase order, this sale has a value of about $2.34 million, and the new stations are planned for installation around the middle of 2019. The stations will help H2 Mobility further their goal of deploying a network of about 100 hydrogen fueling stations in Germany by the end of 2020. In addition, on July 6 Nel announced that it has been awarded over NOK 7.5 million (about $925,000) to construct two hydrogen refueling stations in Sønderborg and Herning, Denmark. The station in Sønderborg will service an initial fleet of fuel cell vehicles (FCVs) owned by municipal waste and recycling company Sønderborg Forsyning, and the station in Herning will service a fleet of vehicles for their municipal government, as well as other vehicles operated locally. According to Nel, the Herning station will be adapted to enable testing of future H2Station technologies, and can potentially fuel heavy-duty FCVs such as trucks, buses and vans. 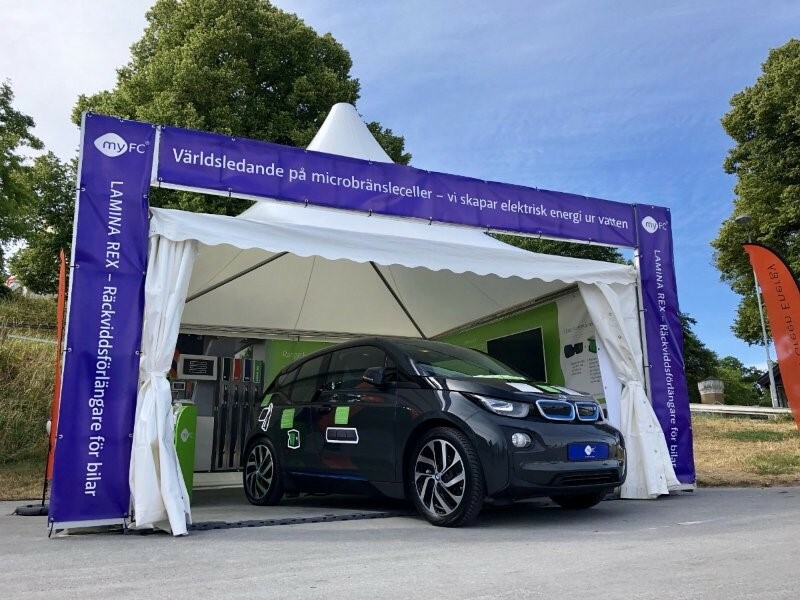 Earlier this month, FCHEA member myFC demonstrated a prototype of their LAMINA REX hydrogen fuel cell range extender for electric vehicles at the Almedalen Political Week in Visby, Sweden. According to myFC, though the technology is still in development , the LAMINA REX range extender was able to successfully power an electric vehicle in controlled conditions at the event. LAMINA REX is able to convert water into hydrogen onboard the electric vehicle, which powers a fuel cell that can extend the car's driving range past its lithium-ion battery's capabilities. 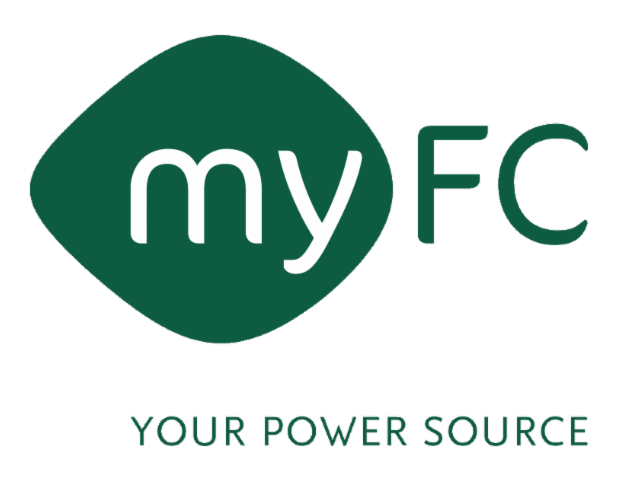 Click here for the full press release from myFC. On June 28, Air Liquide announced a new parternship with the Shanghai Sinotran New Energy Automobile Operation startup (STNE) to accelerate the deployment of hydrogen fuel cell-powered truck fleets in China. Through this partnership, Air Liquide will acquire a minority stake of around 10 million euros (about $11.64 million) in STNE, which currently operates a hydrogen station in Shanghai and a fleet of 500 hydrogen-powered trucks. As part of the agreement, Air Liquide will provide STNE with its expertise in the full hydrogen supply chain to accelerate the startup’s development. STNE aims to run a fleet of up to 7,500 trucks and to operate a network of around 25 hydrogen stations by 2020. Click here for the full press release from Air Liquide. 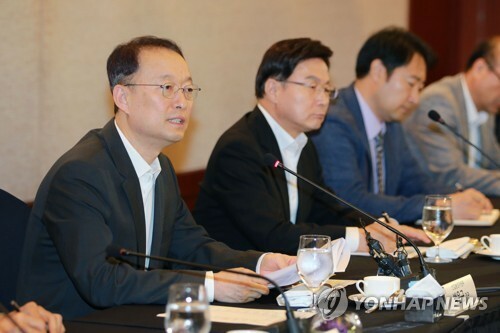 On June 25, South Korea's Ministry of Trade, Industry and Energy announced that they will invest 2.6 trillion won (about 2.34 billion USD) by 2022 to develop fuel cell vehicles (FCV) and hydrogen fueling infrastructure throughout the country. In a meeting with representatives from local automakers and state utility companies, Minister Paik Un-gyu said that the Ministry aims for a commercial deployment of about about 16,000 FCVs and 310 hydrogen stations nationwide by 2022. As previously reported, the Ministry, local automakers, and state-run utilities companies have agreed to establish a special purpose company by November to help overcome business hurdles for the emerging FCV market. The Ministry also announced that it will revise regulations for a stable supply of hydrogen fuel and establish a distribution center by next year, paving the way for the mass commercialization of the eco-friendly vehicles. Click here for the full article from South Korea's Yonhap News agency. The European Commission's Community Research and Development Information Service (CORDIS) recently announced that starting in 2019, 62 hydrogen-powered buses will be introduced into the public transportation systems of British cities Aberdeen and Dundee and Germany’s Cologne and Wuppertal. Forty of the buses will be deployed in Germany. Cologne will receive thirty new buses to expand its existing fleet while Wuppertal will receive its first ten fuel cell buses. In the United Kingdom, Dundee will receive twelve fuel cell buses, while Aberdeen will add ten buses to its extensive municipal fleet of hydrogen-powered vehicles. Funding for the deployment of the buses comes from two rounds of the European Union's Joint Initiative for hydrogen Vehicles across Europe (JIVE), which strives to advance the commercialization of fuel cell buses through large-scale deployment of vehicles and infrastructure. Click here for the full news release from CORDIS. On July 3, members of the United Kingdom's House of Commons and House of Lords announced the formation of an All Party Parliamentary Group (APPG) on Hydrogen. The cross-party group will focus on raising awareness of, and building support for large scale hydrogen projects, such as conversion to a hydrogen domestic gas grid that will enable the country to meet decarbonization targets set through the Climate Change Act and the Paris Climate Change Agreement. The APPG is sponsored by the United Kingdom's four gas distribution networks that cover England, Scotland and Wales, along with the Energy and Utilities Alliance, a nonprofit trade association. In addition, the British public sector labor union UNISON and general labor union GMB support the APPG due to the ability of large scale hydrogen projects to create and sustain thousands of jobs. The Right Honorable Claire Perry MP, Minister for Energy and Clean Growth welcomed the formation of the APPG, along with Alan Whitehead MP, Shadow Minister for Energy and Climate Change. Anna Turley, Labour MP for Redcar and a member of the Business, Energy and Industrial Strategy Select Committee will chair the APPG. Click here for the full press release from London-based communications agency Connect, which will serve as the Secretariat for the APPG on Hydrogen. The H2FIRST Reference Stations for Urban Sites project is creating compact gaseous and liquid hydrogen reference station designs appropriate for urban locations, enabled by hazard/harm mitigations, near-term technology and fire code improvements, and risk-informed (performance-based) analyses. This workshop presents a number of hazard and risk analysis techniques and methods as applied to reference station designs, enabling participants to apply or interpret similar analyses in the real world. Workshop leaders will also present preliminary results on the effect of NFPA 2 requirements on various station designs, and solicit feedback from stakeholders to improve the analysis further. Discuss how NFPA 2 is, can, or should be used to site stations. Learn about various footprint-reducing methods, including below ground, rooftop, delivery truck size, and comparative risk. Learn to use and interpret results from the Hydrogen Risk Assessment Models (HyRAM) software. Give feedback to the Urban Sites team to make sure results are relevant and consistent with real-world station siting. Tour a lab to learn how measurements are taken to study the behavior of cryogenic hydrogen. Visit a nearby hydrogen refueling station to see real-world application. Click here to RSVP for this workshop. Where Will EVs Get Their Juice? 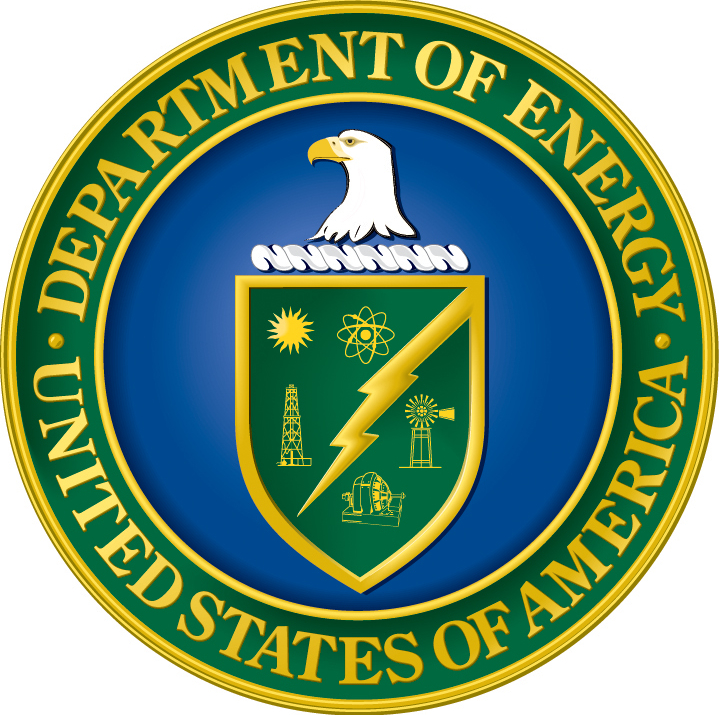 The U.S. Department of Energy’s (DOE), Office of Energy Efficiency and Renewable Energy, Fuel Cell Technologies Office (FCTO) has issued a Request for Information (RFI) on behalf of its Hydrogen and Fuel Cell Program (referred to herein as the “Program”) which includes coordinated activities across all offices within DOE that are engaged in hydrogen and fuel cell activities. The Program seeks input on priority research and development (R&D) areas for reducing regulatory barriers to deployment of hydrogen technologies, with a particular focus on hydrogen infrastructure. In addition to a focus on transportation and streamlining private sector roll out of hydrogen fueling stations, the Program seeks input relating to large-scale hydrogen deployments for applications such as energy storage, grid services, hydrogen transport, natural gas blending or other end uses. Based on the input received through this request for information, DOE will look to provide feedback to relevant agencies with regulatory authority. The comment period for the RFI will close at 5:00 PM (ET) on August 10, 2018. Click here for the full RFI from DOE. On July 19, the Massachusetts Department of Environmental Protection (MassDEP) released their draft Beneficiary Plan for the Volkswagen Environmental Mitigation Trust, which allocates about $75 million to the state. The Plan includes funding for fuel cell-powered technology across a variety of applications, along with assistance for the development of hydrogen stations for fuel cell vehicles (FCV). $7.5 million made available through an open solicitation for proposals to implement projects eligible under any of the Environmental Mitigation Actions (EMAs), except the EVSE EMA, allowed under the VW Settlement. The funding for light-duty EVSE does include hydrogen infrastructure as an eligible project, with up to 33% of the cost for the infrastructure to be covered by EMT funds. In his 2018 State of the State, Governor Andrew M. Cuomo announced a 1,500 MW energy storage target for New York State by 2025 to put New York on a path toward a 2030 target to be announced in late 2018. To help reach these targets, NYSERDA and the Department of Public Service (DPS), in conjunction with stakeholders, developed the New York State Energy Storage Roadmap. The Roadmap identifies the most promising near-term policies, regulations, and initiatives needed to realize the Governor’s ambitious 2025 energy storage target in anticipation of a 2030 target to be established later this year, per legislation, by the New York State Public Service Commission (PSC). Multiple technical conferences will be held throughout the State to allow for public feedback on recommendations and approaches identified in the Roadmap. The PSC has created a new proceeding to consider and establish a 2030 storage target and the deployment mechanisms to achieve the 2025 and 2030 energy storage targets by the end of the year. Public comments on the Roadmap can be submitted via the DPS website until September 4, 2018. The Pennsylvania Department of Environmental Protection (DEP) has allocated $5 million in funding for its Alternative Fuels Incentive Grant (AFIG) Program. AFIG can assist school districts, municipal authorities, nonprofits, corporations, LLCs, and partnerships registered to do business in Pennsylvania in offsetting the costs of implementing alternative fuel using transportation projects. According to DEP, for new hydrogen fuel cell vehicles, applicants may request 100% of the incremental cost of the vehicle up to $40,000 per vehicle. This year's AFIG grants give priority to projects that include the use of emergency vehicles for response, rescue, and evacuation operations. DEP will collect and review Applications received by 4 PM on Friday, December 14, 2018. More information on applying to the AFIG Program can be found here. The Maryland Energy Administration (MEA) is accepting applications for its competitive Alternative Fuel Infrastructure Program (AFIP). The program is designed to aid in the development of alternative fuel refueling/recharging infrastructure in Maryland. Each applicant’s cost share must be at least 50% of the total project cost. Eligible projects include natural gas refueling with fast-fill dispensers, propane refueling, ethanol refueling, DC fast-charging and hydrogen refueling. As of now, MEA's budget for the Fiscal Year 2019 AFIP is up to $500,000. However, MEA reserves the right to increase or decrease the program budget. Grant awards for hydrogen refueling stations are capped at a maximum of $300,000 per station. Completed applications must be received at MEA no later than December 31, 2018 at 5:00 PM EST. Click here to access the FY 2019 application and program guidelines. NYSERDA’s Stationary Fuel Cell Program aims to quickly increase the amount of electricity produced by fuel cell systems in New York State. By providing $15 million over two years, NYSERDA will help facilities to reduce the upfront costs of installing and operating fuel cells and support commercially viable fuel cell systems that help lower greenhouse gas emissions. NYSERDA will provide $7.5 million a year for two years for a total of $15 million to support new installations of stationary fuel cell systems at eligible sites. No system can receive more than $1 million from NYSERDA. Apply online using NYSERDA’s application portal. Applications close at 5 p.m. Eastern Time on December 31, 2019. Click here for the full solicitation from NYSERDA. Press releases and story ideas may be forwarded to Connor Dolan and Karen Quackenbush for consideration at cdolan@fchea.org and khall@fchea.org respectively. If your company is interested in joining FCHEA, please visit fchea.org or contact Connor Dolan at cdolan@fchea.org . Fuel Cell and Hydrogen Energy Association -- The Fuel Cell and Hydrogen Energy Association (FCHEA) is the trade association for the fuel cell and hydrogen energy industry, and is dedicated to the commercialization of fuel cells and hydrogen energy technologies. Fuel cells and hydrogen energy technologies deliver clean, reliable power to leading edge corporate, academic and public sector users, and FCHEA members are helping to transform the our energy future. FCHEA represents the full global supply chain, including universities, government laboratories and agencies, trade associations, fuel cell materials, components and systems manufacturers, hydrogen producers and fuel distributors, utilities and other end users. National Energy Technology Laboratory -- The National Energy Technology Laboratory (NETL), part of the U.S. Department of Energy (DOE) national laboratory system is owned and operated by the DOE. Its mission is "advancing energy options to fuel our economy, strengthen our security, and improve our environment." NETL performs, procures, and partners with universities and the private sector. Together, these efforts focus a wealth of scientific and engineering talent on creating commercially viable solutions to national energy and environmental problems. NETL has expertise in coal, natural gas, and oil technologies, contract and project management, analysis of energy systems, and international energy issues. NETL supports the DOE's mission to advance the national, economic, and energy security of the United States. Click here for an archive of previous issues of the Fuel Cell and Hydrogen Energy Connection.